Last weekend I visited Kansas City, MO and a town about an hour north called St. Joseph. This might well have been my last visit to the area for a while (or possibly ever), so I took the opportunity to revisit some of my favorite dining establishments in the area. The next few blog posts will feature my "last meals" in KCMO. 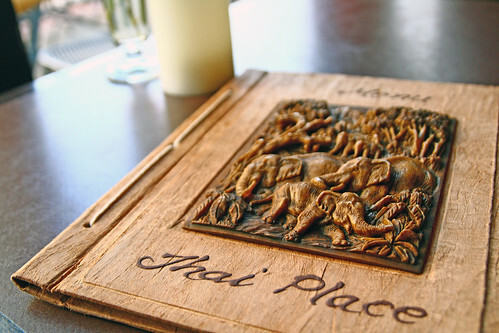 One of my favorite restaurants in Kansas City is Thai Place Restaurant, in the cute historic Westport neighborhood of Kansas City. 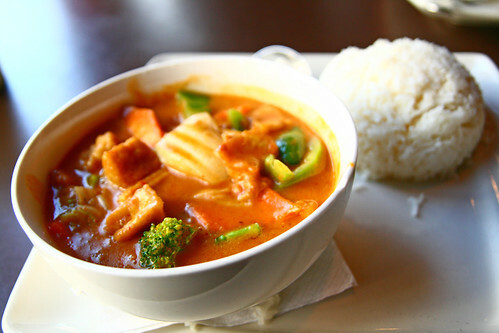 I like Thai Place not so much for its curry - it's good, but I wouldn't say it's significantly better than other Thai restaurants I've been to. 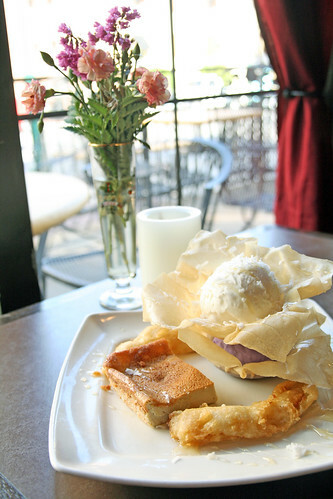 However, I do love the quiet atmosphere, the beautiful decor, the friendly and speedy service, and the desserts. I only ate half my entree, as I needed to save room for the memorable dessert I had had at Thai Place two years ago when I celebrated my birthday here. It was memorable partly because Thai Place serves the ever-so-hard-to-find taro/ube ice cream - something I had been unable to locate anywhere in DC where I was living at the time, and something I have yet to see in Pittsburgh. As an aside, taro and ube (purple yam) are actually two different things, but often confused with one another. It was unclear which flavor Thai Place actually served because it was identified as both on the menu. 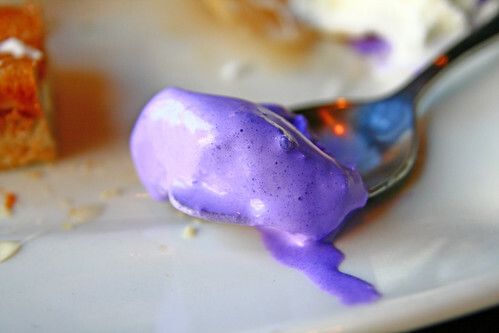 I suspect that it may actually be ube because of its bright lavender color (just like 99% of the desserts out there identified - or misidentified - as taro), because I know for a fact that fresh taro ice cream is actually nearly white in color, while ube ice cream is dark purple. Whatever it really is, taro/ube ice cream has always been one of my favorites. Anyway, I digress. On this visit, R. and I shared the dessert we had had here two years ago, the Thai Place Dessert Plate. It combines three of their desserts: 1) the Coco Tower, which is basically two large scoops of coconut ice cream in crispy thin spring roll wraps, 2) the Baked Coconut Custard, and 3) Fried Banana topped with honey. Our server knew we had wanted some taro/ube ice cream for our dessert, and allowed us to substitute one of the scoops of coconut ice cream with taro/ube ice cream. Perfect! We were completely stuffed after this meal we had to take a long walk afterwards, but it was so satisfying!